Biostatistics and Risk Assessment Center (BRAC) Sponsored Seminar with Dr. Paul Albert - December 6, 2017: A group picture after the seminar with Dr. Paul Albert, Chief and Senior Investigator of the Biostatistics Branch, Division of Cancer Epidemiology and Genetics, National Cancer Institute. Biostatistics and Risk Assessment Center (BRAC) Sponsored Seminar with Dr. Aiyi Liu - November 29, 2017: A group picture after the seminar with Dr. Aiyi Liu, Senior Investigator and Acting Chief of the Biostatistics and Bioinformatics Branch, Division of Intramural Population Health Research , National Institute of Child Health and Human Development, National Institutes of Health (NIH). Maryland Day 2017 - April 29, 2017: Pictures of attendees at Maryland Day 2017 by Dr. Hongjie Liu. SPH Diversity Dialogue with Mr. Aranthan Jones - March 2, 2017: Mr. Aranthan Jones, Chief of Staff at the W.K. 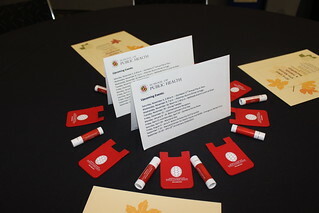 Kellogg Foundation, Inc. presented a “policy 101” talk to School of Public Health faculty, staff, and students. EPIB Seminar on HHS Data Policy and Strategy with Dr. Rashida Dorsey - December 2, 2016: Dr. Robert Gold and faculty with seminar speaker Dr. Rashida Dorsey, Director of Data Policy within the Office of the Assistant Secretary for Planning and Evaluation (ASPE), U.S. Department of Health and Human Services (HHS) and Senior Advisor on Minority Health and Health Disparities. Biostatistics and Risk Assessment Center (BRAC) Sponsored Seminar with Dr. Lilly Yue - November 30, 2016: A group picture after the seminar with Dr. Lilly Yue, Deputy Director for Pre-Market and Operations, Division of Biostatistics, Center for Devices and Radiological Health, U.S. Food and Drug Administration (FDA). 2016 APHA Annual Meeting and Expo - November 1, 2016: Jennifer Guida (left), doctoral candidate in epidemiology, presenting her poster titled, "Functional impairment and depression in older adult couples: The mediating role of social support at the dyadic level." 2016 APHA Annual Meeting and Expo - October 30, 2016: EPIB faculty, students and alumni at the 2016 APHA Annual Meeting in Denver, Colorado. Biostatistics and Risk Assessment Center (BRAC) Sponsored Seminar with Dr. Colin Wu - October 26, 2016: Dr. Colin Wu, Mathematical Statistician, National Heart, Lung, and Blood Institute (NHLBI), National Institutes of Health (NIH) with faculty, students, and event organizer Dr. Mei-Ling Ting Lee, Professor in the Department of Epidemiology and Biostatistics and BRAC Director. Fall 2016 SPH Open House - October 23, 2016: Dr. Brit Saksvig, Associate Research Professor, Epidemiology and Biostatistics Assistant Chair, and Director of Graduate Studies, speaking with prospective students during the Epidemiology and Biostatistics session. 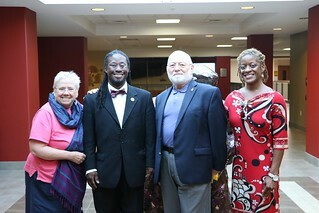 Grand Rounds: Responding To Zika - An Epidemiologist’s Perspective - September 22, 2016: Dean Jane Clark, Dr. Robert Gold, and Dr. Typhanye Dyer with guest speaker Dr. Oscar Alleyne, Senior Advisor for the National Association of County and City Health Officials (NACCHO) Public Health Program..
Public Health Research @ Maryland Day - April 5, 2016: Dean Clark provided welcoming remarks at Public Health Research @ Maryland Day. Fall 2015 Commencement - January 12, 2016: Dr. Lawrence A. Tabak, Principal Deputy Director of the National Institutes of Health, delivered the commencement address for the UM SPH Fall 2015 graduates. 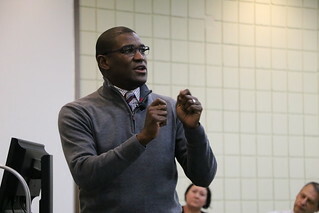 Graduate Student Orientation Fall 2015 - August 25, 2015: Dean Clark weclomed incoming SPH graduate students at the Fall 2015 Graduate Student Orientation. SPH "Diversity Dialogue" - March 10, 2015: Dr. Camara Jones, President of the American Public Health Association and Senior Fellow at the Satcher Health Leadership Institute and the Cardiovascular Research Institute, Morehouse School of Medicine, delivering her talk titled,"Achieving Health Equity: Tools for a National Campaign Against Racism." First Course Meeting Using Videoconferencing Technology - August 27, 2014: An early start to collaborative education between College Park and Baltimore. Lisa Bowen, Rod Turpin, and Asia Wyatt take Infectious Disease Epidemiology taught by Dr. Samer El-Kamary at the University of Maryland, Baltimore. 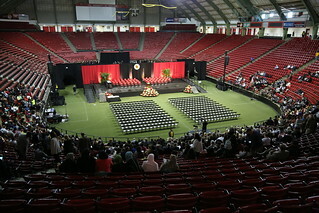 Commencement Address - May 21, 2014: Dr. Josh Sharfstein, Secretary of the Maryland Department of Health and Mental Hygiene, delivered his commencement address to the graduates of the Class of 2014 from the University of Maryland School of Public Health. Dean's Medal Recipient, Dr. Carlessia Hussein - May 21, 2014: Carlessia A. Hussein, RN, DrPH, Director of the Maryland Department of Health and Mental Hygiene Office of Minority Health and Health Disparities is the 2014 receipient of the University of Maryland School of Public Health Dean's Medal. Dean's Scholars Dinner - April 17, 2014: Graciela Jaschek, PhD student in Epidemiology receiving Dean's Scholar Award accompanied by Dr. Jane Clark, Dean of the University of Maryland School of Public Health and Dr. Olivia Carter-Pokras, Associate Professor in the Department of Epidemiology and Biostatistics who served as Ms. Jaschek's dissertation advisor. Grand Rounds: So You Think You Can Innovate? - September 20, 2013: Dr. Roberta Ness, former Dean, University of Texas Health Science Center, School of Public Health, Houston, TX, with then Dean Jane Clark, following Dr. Ness' presentation on innovation. Spring Faculty Assembly Honors and Awards - May 20, 2013: Dr. Xin He, Assistant Professor of Biostatistics receives the Doris Sands Excellence In Teaching award from previous recipient Dr. Karoline Mortensen, Assistant Professor, Health Services Administration. Research @ Maryland Day - April 4, 2013: Dr. Jay Perman, President of the University of Maryland, Baltimore and Dr. Robert S. Gold, Founding Dean of the University of Maryland School of Public Health, College Park at Research @ Maryland Day, April 4, 2013. 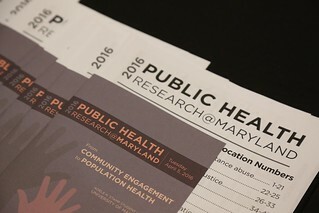 Dr. Gold is currently Chair, Department of Epidemiology and Biostatistics, University of Maryland School of Public Health. Research @ Maryland Day - April 4, 2013: Dr. Jane E. Clark, Dean, University of Maryland School of Public Health and Dr. Jay Magaziner, Chair, Department of Epidemiology and Public Health, School of Medicine, University of Maryland, Baltimore meet with Dr. D. A. Henderson at Research @ Maryland Day, April 4, 2013. Dr. Henderson is the physician and epidemiologist who let the international effort to eradicate smalpox in the 1960's. Read more about Dr. Henderson in the Smithsonian report by RM Henig "35 Who Made A Difference." University of Southern California Presentation - February 6, 2012: Dr. Sunmin Lee presenting at the USC Institute for Health Promotion & Disease Prevention Research and the Immigrant Health Initiative on February 6, 2012. At this lecture, Dr. Lee discussed findings from an ongoing project, "Asian American Liver Cancer Education Program in Maryland," a research collaboration between the University of Maryland School of Public Health and John Hopkins Bloomberg School of Public Health. Society For Public Health Education (SOPHE) Annual Meeting - October 30, 2011: Robert S. Gold, Chair, Department of Epidemiology and Biostatistics, University of Maryland School of Public Health was installed as the president of the Society for Public Health Education. Former DHHS Secretary Sebelius was the keynote speaker at the SOPHE 62nd Annual Meeting, held October 27-29, 2011 in Arlington, VA. Also with Drs. 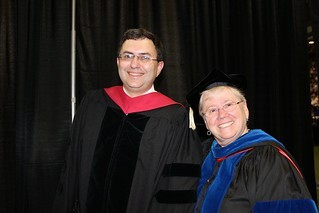 Gold and Sebelius are Ms. Elaine Auld, CEO of SOPHE, and former President Dr. Daniel Perales. American Public Health Association (APHA) Executive Board Meeting - January 12, 2010: APHA Executive Board member Olivia Carter-Pokras, right, brings up a point of discussion during the board's meeting in January in Washington, D.C. At left is fellow board member Joseph Telfair.